What Does It Mean to Advocate with Compassion? Ask others what they love. Ask what their positive hopeful vision for NC before you discuss the issues you care about. Learn how and why others do what they do. Try to understand their beliefs and values. Include everyone. It’s not about us against them. If we are practicing creation then as a part of that we are caring for ourselves. What is the difference between advocating and lobbying? The simplest explanation is lobbying happens when you ask an elected official to vote a certain way on legislation. Advocating is when you are educating officials on specific issues, expressing your opinion on issues, and/or asking for their opinion on a problem. How do I talk about my faith and advocate? Lawmakers, from legislators to county commissioners, have communicated with NCIPL time and time again that they want to hear what the faith community has to say about energy issues in our state. Policymakers do not expect people of faith to speak “as experts” in the field of science or the technology of energy (if you would like to address these issues, though, don’t hesitate) but rather look to the faith community for guidance on the morality concerning these issues. 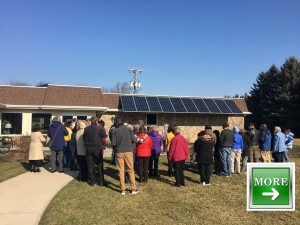 Lay and ordained faith leaders from around the state have voiced theologically-based support for clean, renewable-based energy. Read some of the excerpts from recent faith-oriented testimonies here. We offer statements by various faith traditions and denominations and more on our faith-based resources page. Sign up to view our Advocating with Compassion Webinar. How can I put my faith in action? There are many different actions you could take which are a vital part of the work NCIPL does. By taking action online or offline you help to educate your community, your elected officials, and raise the importance of an issue. This helps lay the ground work for advocacy organizations, like NCIPL, to have in depth and more technical conversations with our decision makers. Personal Choices — decisions you can make every day that have an impact. These are also important stories you can tell when talking with your elected officials. Advocacy — describes a way of engaging in the public policy process that helps build public awareness, adds the people’s voice to problems, & gets elected officials attention. Lobbying – a form of advocacy more narrowly defined as asking an elected official to take a certain position on a specific piece of legislation.